What is Pellucid Marginal Corneal Degeneration (PMD)? In short it is an eye disease very similar to Keratoconus in that it also causes thinning of the corneas. The difference between Keratoconus and Pellucid Marginal Corneal Degeneration is that PMD causes a crescent shaped band of thinning in the lower region of the eye, while the central cornea is usually of a normal thickness; as well as the cornea appearing transparent in PMD . There is a third disease called Keratoglobus that like the previous two also causes corneal thinning (more about this disease will be discussed in a future post). Now you may ask if there is an actual difference between Keratoconus and PMD and Keratoglobus or if the three diseases are the same. The answer is that doctors are not sure either. They do not know if the three eye diseases are different diseases, or just different phenotypic (expression) variations of one disease. Some of the different signs of PMD may include drastically reduced uncorrected visual acuity that usually cannot be improved with glasses (usually for astigmatism), roughly normal pinhole visual acuity, and refraction/keratometry that shows against the rule astigmatism (where the astigmatism on a corneal topography is seen horizontally). Patients are also commonly asymptomatic except for the gradual worsening of vision that is unaided by glasses. The clinical diagnosis for PMD is the same as Keratoconus where the patient is examined by doctor on a slit lamp microscope and checked with patient’s history and supported by corneal topography & pachymetry. We have been talking about how cross linking can help patients suffering from Keratoconus. We may’ve a bigger issue to confront. What about before cross linking, what about the diagnosis and screening of Keratoconus. It is important for patients with Keratoconus to be screened as early as possible. The best results with corneal cross linking eye procedure are obtained when the disorder is arrested early. As the disease progresses the loss of visual acuity increases dramatically, and the earlier it is detected the easier and higher possibility that full visual acuity returns. You may want to read some frequently asked questions on keratoconus and cross linking. Some symptoms of Keratoconus are blurry vision, increased light sensitivity, eye strain, headaches/general eye pain, eye irritation/excessive eye rubbing. A caution should be noted that these symptoms can also be indications of other eye problems. That is why it i important to see a keratoconus expert. The doc in conjunction with measurement of the curvature of the cornea, a depth map and examining the eyes can identify the disease more early and accurately. From a doctor’s perspective, as they physically examine the eye with a microscope, the signs they would be looking for are corneal thinning, Fleischer’s ring, Vogt’s striae, and apical scarring. The measuring of the corneal curvature can be done three different ways: first would be keratometry, second is corneal tomography, and third is a corneal OCT. Though all three should performed for increasing the accuracy of the measurement. Now that you have a basic understanding of importance of early detection try our quiz on keratoconus. We talked last time about getting screened for Keratoconus and the importance of early diagnosis. Today let’s talk about what to expect after the cross linking procedure has finished. Immediately after the UV-A light part of the surgery is over, a bandage contact lens will be put in the eye. This is done in order to protect the eye from dust,wind, et cetera. The second important reason is that it prevents the lid from rubbing the abraded cornea. If it is not put or falls off the lid like a windshield wiper can sweep healing cells and irritate the corneal nerves. A topical antibiotic, a non-steroidal anti-inflammatory (NSAID), 4 times a day for the first week. A steroid will be prescribed once the epithelium has healed completely.The steroid being usually continued for another 1-3 weeks. The Keratoconus surgeon will usually follow up with an appointment with in 24 to 48 hours as well as the week following surgery to make sure the eye is healing properly. If needed, after the epithelium is intact, the doctor would send the patient’s back to co-managing doctors for the remainder of their follow up care. We all have to be careful during the post period to avoid touching or rubbing the eye. Some discomfort and watering of the eye is to be expected. If you develop sever pain or discharge contact doc immidiately. New Scleral contacts or old soft lens may continued under the watchful eyes of the keratoconus doctor. I am amazed when doctors claim that they have invented a procedure even though it has existed for years before. For example a surgeon claiming they invented cornea cross linking even though it was being performed in Europe for many years. What gets me peeved is that some doctors use unproven technology and convince patients its the best. Snake oil sellers are an amusement till patients are harmed. So I decided to list some truths about keratoconous eye disease and cornea collagen cross linking. The 10 Golden Truths about Cornea Cross Linking By Rajesh Khanna, MD a Keratoconus specialist. Keratoconus is a sight threatening disease. It involves the thinning and bulging of the cornea. Cornea Collagen Cross Linking (CXL) is a proven and effective way to halt the progression of progressive keratoconus eye disease. CXL may be used to stabilize post lasik ectasia. Epithelium off Cornea cross linking is more effective than epi on cross linking. Conventional cornea cross linking – 3 mw for 30 minutes is the gold standard. Conventional cross linking is more effective than accelerated cross linking (18 mw or 30 mw). No other power setting is better. No studies have shown epi on cross linking to be more effective than conventional epi off cross linking. FDA has only approved Avedro KXL system/Photrexa for treatment of progressive keratoconus. No other system nor riboflavin compound has passed that litmus test. I would invite comments by optometrists, ophthalmologists and peers especially keratoeonus experts. 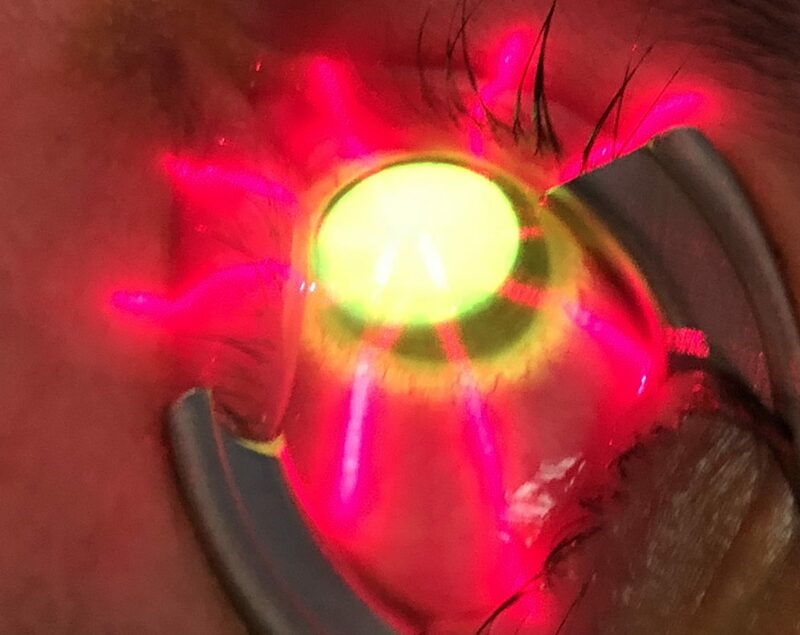 Avedro KXL system in the hands of an experienced Keratoconus surgeon following FDA protocols would be safer than an unproven experimental epi on technology. We therefore offer Avedro cornea collagen cross linking with the FDA approved protocol. We have been receiving a lot of questions from patients via social media and telephone calls. People out there are confused regarding the safety and efficacy of the various advertised treatment methods for keratoconus. This is a quick recap of the currently available interventions to help people suffering from keratoconus eye disease. We have Intacs, Cornea Cross Linking, DALK and Corneal transplant. DALK and Corneal Transplant are surgical techniques and thus are not in the purview of the FDA. Let us confine our discussion today than to Intacs and Cross Linking for keratoconus eye disease. Yes Intacs are the only intracorneal ring implants approved by FDA. Others like Ferras rings are not approved and cannot be sold in USA. Dr. Khanna is one of the participants in an Institutional Review Board monitoring by Integrview. This ongoing oversight ensures that the results are safe. Is Corneal Cross linking FDA approved? There are three types of Corneal cross linking available in the US today. FDA approved : There is one and only one FDA approved – KXL device and riboflavin called Photrexa manufactured by Avedro. This means that Avedro did a clinical study to demonstrate the safety and efficacy of their formulation with their unique device. Data was submitted to the FDA. Federal Drug and Administration studied the reports. They asked questions and requested more data. Once this was reviewed FDA approved the Avedro method. Clinical studies : There are clinical studies being performed by different groups like the AECOS and CXL study groups. FDA has not given the green light on them. God Given: These are devices which doctors cannot explain how they arrived in their offices or surgery rooms. The data from these unexplained devices is not being submitted to FDA nor even peer review. No one knows what drugs are being used. FDA ensures the safety of our eyes. They review the statistical data to keep us safe. Therefore when comparing different treatments it is easier for us to know which is safer. Since there is only one FDA approved cross linking procedure, choose AVEDRO Cornea Cross Linking. Learn more about treatment modalities for keratoconus. Pupil Tracking in Cornea cross linking for Keratoconus. We have been talking about the advantages of epithelium off cross linking. This from of cross linking has shown to work in numerous studies across the world. But are all delivery methods the same? Certain machines hope the patient keeps looking at the UV light. Have you tried staring at something for 30 minutes. As a kid you may have played the stare off game. Its tough to do it especially in Los Angeles with the dry weather. The solution in this fight against keratoconus is to involve a pupil tracker. In the above video you will see it in action. If the eye moves away from the light, the UV delivery and timer will stop. You can set how much movement you are willing to allow. This increases the safety. One can definitely know that 30 minutes was delivered. It can avoid a situation where a fidgety patients moves and receives only 20 minutes of the radiation. Increasing safety also relaxes the patients. Most of the people requiring this intervention against Keratoconus eye disease are teenagers. Pupil tracking rocks. Epithelium off Cornea collagen cross linking (CXL) is not voodoo. We realize that early in new technology a lot of unfounded claims like epi on CXL being Better than epi off might be made. It behooves us clinicians to present proof to peers. There is a symbiosis between diagnostic technology and treatments. We will take help of Carl Zeiss Ocular coherence tomography to demonstrate the effectiveness of epi off CXL. Here is a High Density picture of a keratoconus cornea before any treatment. It is early keratoconus in a young girl. This is the best time to intervene to treat Keratoconus. Look how uniform the picture is. The top layer of epithelium can be clearly seen. We remove this layer with laser or as Professor Theo Seiler recommends with ethyl alcohol. Epithelium prevents riboflavin from entering the stroma and hinders the UV absorption. Look at the picture below. You can clearly see a haze which ends around 80 % depth as a line of demarcation. The same line of demarcation after cornea cross linking is better highlighted in they colored OCT of the Cornea. If you are suffering from Keratoconus Call 805-283-6520 to see if cross linking of cornea is the best option for you. BMW on the autobahn is a hair rising experience. Now our German friends want to bring that concept to cxl or corneal cross linking. You may have heard of accelerated cornea cross linking? This is cxl with 10 minutes of UV radiation treatment, In the newest version they propose treatment of only 5 minutes utilizing 18 mw/cm2 of UV radiation. This would of great benefit to patients. The amount of time they have to stare at the blue light would decrease. Exposure of the cornea to the elements would be less. Our question for the authors are. 1) How deep was the demarcation line? 2) was any comparison made to conventional cross linking? Other papers or followup studies should be address the questions. Dr.Khanna is a Keratoconus Expert. These informative blog posts are for information purposes. They should not replace a careful discussion with you Keratoconus Eye surgeon.